Following the record gains in silver during late 2010 and early 2011, the metal crashed towards $25 and has since rebounded to around $33. Investor sentiment has crashed along with it. The threat of Euro nations defaulting, banks announcing they are, well, bankrupt, and a series of other factors have scared away many of the Johnny-come-lately silver bulls. I think too many investors are underestimating the power of the central banks. While I agree they are running out of options, it seems that their ability to kick the can down the road has yet to expire. Given that the United States is heading into election season and President Obama is in full campaign mode, I expect the administration to pull out all stops in order to continue the illusion of economic prosperity a while longer. Every economic fire of consequence is being extinguished with fresh liquidity, more funny money or new legislation. In case you missed it, QE3 has been in full force for quite some time, albeit executed in a somewhat stealth manner. 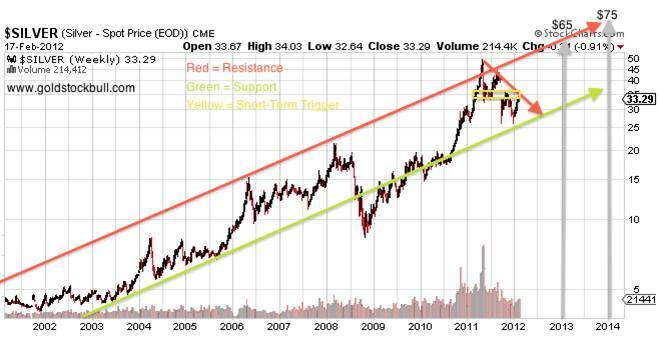 The implications for silver (and gold to a lesser degree) are going to be incredibly bullish. Absent a deflationary sovereign default that spirals out of control and takes down major banks with it, stocks will continue to creep higher in volatile trade throughout the year. Once fear begins to subside, look for precious metals to come roaring back to new highs by mid-year. Whenever the next financial crisis finally hits, we are likely to witness a new injection of quantitative easing that is even stronger than what transpired in 2008. Will a major debt default pull down gold, silver and mining stocks with it? Absolutely. Will it last? Not likely. Investors are a predictable bunch. They always overshoot on emotions in one direction or another. A rush for liquidity and the perceived “safety�? of government bonds or U.S. dollars will be incredibly short-lived and viewed in retrospect as immensely short-sighted. Everyone that rushed for the door by dumping real assets will soon regret their folly. When the fear subsides and some semblance of rational thought returns, the realization of the worthlessness of government paper will be widespread and cause a mass exodus of fiat money. So while it is prudent to hold a decent amount of cash in the short term, hoping to buy the irrational dip, the medium to long-term investor might consider buying silver aggressively at this juncture. In my view, commodity prices are either going to continue grinding higher throughout the remainder of the year, or there will be a short and steep dip, following by a resumption to new highs. Either way, the silver price has a long way to go before reaching previous inflation-adjusted highs. It would need to climb to $150 to reach its 1980 high using officially-suppressed inflation statistics and closer to $300 using honest inflation statistics. Seeing as you can buy silver at around $33 today, the upside potential remains absolutely huge. Let’s take a look at the long-term chart to determine price targets for 2012 and 2013. Charting back to the start of the silver bull market, we can see that silver remains firmly in its multi-year uptrend. Contrary to negative sentiment expressed by some analysts, there has been no significant chart damage or other action to suggest that the bull market has run its course. Silver recently bounced off the bottom line of its trend channel, which also corresponds roughly with the 100-day moving average. This line has provided support during every one of silver’s corrections over the past decade, with the exception of the 2008 financial crisis. I expect it to continue to provide support during the current correction/consolidation. While we could see one more quick dip below $30, I think any talk of a decline to $25 or lower is now firmly off the table. Silver is currently facing resistance at the critical level of $35. If it breaks to the upside through this level, I believe silver will quickly climb to challenge the $50 mark once again and reach a high between $55 and $65 by year end. To the downside, I think the lowest silver will close out the year is around $31, in the event that short-term deflationary forces take hold. But as mentioned earlier, I think the central banks stand ready to do whatever is necessary in order to prevent such an outcome. These projections are relatively conservative and based on the long-term trend trajectory. Any number of events could send silver parabolic in the blink of an eye. The silver market is tiny in relationship to the paper money market and if even a small percentage of those dollars decide to buy silver, demand will overwhelm supply and send prices into triple digits. I ultimately believe silver could reach $500, but the more important consideration is the value/purchasing power increase of silver. One thousand ounces of silver used to be able to buy a median-priced home in the United States and I believe one thousand ounces will once again achieve this same feat in the near future. Some view silver as an inflation hedge or way to preserve purchasing power. I see it as a way to vastly increase purchasing power over the next several years, with the worse case scenario being wealth preservation. I’ll take that risk/reward scenario any day. The fundamentals are very strong for silver at this juncture. The Obama administration just put forth a budget that will result in another annual deficit of over $1 Trillion, despite promising to cut the deficit to $650 billion. The ECB is bathing Euro banks in liquidity and the US Fed has literally guaranteed an inflationary environment until late 2014. These policies create ripe conditions for commodities overall and precious metals in particular to make new all-time highs. With less above-ground investment-grade silver available than gold, the supply/demand situation can not persist much longer at such depressed prices. Physical silver demand is growing and confirming our bullish view, as Silver Eagle sales for January posted the second strongest month ever at 6.1 million ounces! 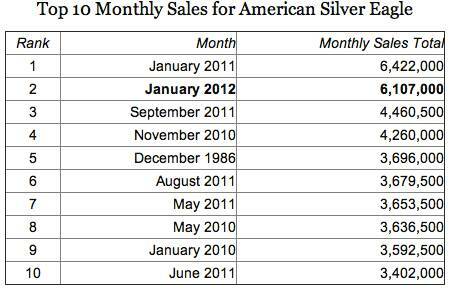 Lastly, silver is the best form of money to own in the event of a collapse in fiat currencies. It will be difficult to use a gold eagle for small purchases, but silver eagles and junk silver will be ideal to use in purchasing food and other goods when the U.S. dollar is no longer accepted. This makes silver attractive not only for the strong returns and ability to increase an investor’s purchasing power, but also as a valuable insurance policy should the current monetary system break down. So don’t miss the train again this time around. While silver is currently in consolidation mode, this is not likely to last long. When the silver price finally takes off once again, there will be little notice or opportunity to jump aboard the speeding train. Silver remains severely undervalued in my estimation and I expect the price to skyrocket in the near future as it approaches new highs. You need only have the courage to take the path less chosen, buy when others aren’t interested and sell when the herd is clamoring to buy silver at any premium. While the next financial crisis may begin with panic selling of precious metals, I believe it will quickly flip to panic buying at very high premiums to spot price. I want to be well-positioned before this occurs and also have some funds on the sidelines to relieve panic sellers of their gold and silver at discount prices. A sensible approach that I advocate is to purchase in tranches, building a position now and adding to it every month or two. This will help to ensure that you don’t go “all in�? at a short-term top and have funds available to take advantage of any major dip. Attempting to time the absolute bottom is nearly impossible, so I view this a opportune moments to establish or increase positions in silver. I am currently adding to my positions, both in physical silver and undervalued silver mining stocks. The equities underperformed significantly last year, but against the backdrop of unlimited central bank easing and liquidity, I think we are likely to see a return to the leverage offered during the early stages of this bull market. Junior mining stocks in particular appear very undervalued at this juncture and could offer staggering gains if my analysis is correct. If you would like to receive the GSB Contrarian Report, download my guide to buying and storing physical precious metals and view all of the stocks that we hold in the Gold Stock Bull portfolio, please click the link at the top of this page.